The Soccer Insiders: Who is on Sergio Ramos' T Shirt? Who is on Sergio Ramos' T Shirt? I received an e-mail from one of our readers today. "Hey Professor," it said, "Sergio Ramos wore a T-Shirt with some guy's picture on it. Who is that guy?" and I realized not everyone knows who Antonio Puerta was. Sergio Ramos and Antonio Puerta both came up together through Sevilla's youth system, from the time they were little boys of around 10 years old or so. By 2004, both played for Spain's U-21 team and started with Sevilla's full squad. Around that time, in 2005, Sergio Ramos was well on his way to becoming a fixture on the Spanish National Team back line, and was signed by Real Madrid. Antonio Puerta kept starting for Sevilla. In the spring of 2006, Puerta scored the only goal in a 1-0 win over Schalke 04 to put Sevilla in the UEFA Cup final. A year later, in May of 2007, Antonio Puerta helped Sevilla win the UEFA cup, scoring in the penalty shootout tiebreaker against RCD Espanyol in the finals. That summer, Puerta got his only cap with the full Spanish National Team in a Euro 2008 qualifier against Sweden. Sevilla opened the following season on August 25, 2007 at home against Getafe, and the crowd were presumably very excited about their defense of the UEFA Cup. The mood changed dramatically when Antonio Puerta collapsed with cardiac arrest at the 35 minute mark. He was rushed to the hospital. Three days later, Antonio Puerta was dead. Multiple cardiac arrests due to a congenital arrythmia led to organ failure and brain damage. Puerta's wife was seven months pregnant at the time. His son, Aitor Antonio, was born two months later. 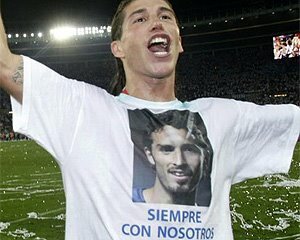 The following year, when Spain won Euro 2008 with Sergio Ramos in the starting lineup, for the team celebrations Ramos changed to a T-Shirt reading "Siempre Con Nosotros" (Always With Us) and Antonio Puerta's picture. The photo you see above is not from yesterday's Euro 2012 win, but from Euro 2008 (notice the longer hair). Sergio Ramos and Jesus Navas (who also came up through Sevilla's youth system) wore the shirts after the World Cup 2010 win. Yesterday, Sergio Ramos, Jesus Navas and Cesc Fabregas also wore the same shirt.